As you may have heard, Yves Saint Laurent: Style is Eternal’ the UK’s first ever YSL retrospective will open this summer at The Bowes Museum in collaboration with Fondation Pierre Bergé-Yves Saint Laurent. A few weeks ago at Show us Your Assets, Alison Nicholson, Digital Communications Officer at the Bowes Museum discussed how she dealt with all the digital activity associated with the announcement of the exhibition. This post will focus on how Alison tried to gain the maximum advantage from the YSL exhibition announcement in January utilising digital tools to build interest and momentum around Bowes Collections and the forthcoming exhibition. 2 weeks before YSL announcement day: They formed a small cross departmental team with members from marketing, IT, exhibitions, and the fashion & textiles curators. They met every morning for two weeks prior to the exhibition announcement to share ideas and creativity and record completed actions. Cutting across departments and sharing ideas regularly, kept the team motivated and proactive. 2 Days before YSL announcement day: The team came together in a dedicated room, taking them away from their desks, enabling them to work closely together. Announcement day: When the exhibition was announced in the press (there was an awful lot of press coverage – which completely exceeded their expectations), the cross departmental team set up a sort of ‘war room’ so they could deal with the press reaction, social media interactions and engagement with audiences in real time. A key element of the Bowes digital activity to compliment the YSL exhibition was to reactivate an existing Fashion at Bowes Twitter account which has previously lain dormant. This account would provide exhibition specific content to a specialist fashion audience. This account was not instead of the Bowes museum main channel, rather to complement the planned social media activity on the Museum’s main channels. They also wanted to develop a dedicated specific following of fashion contacts which would build momentum and interest towards the opening of the exhibition in July 2015. To rejuvenate the twitter account they started by following prominent fashion bloggers and members of the British Fashion Council. Other museums with significant fashion collections and special interest textile groups and societies were also followed. The fashion curator developed a range of fashion and textile content from the collection and shares lots of exhibition installation updates. Alison noted whilst using curatorial time to generate content has had an impact on a limited staff resource; the quality of the content is rich and attractive to the specialist fashion audience. Money is tight for the Bowes Museum, so they don’t have annual subscriptions to a range of analytics tools. Instead for the intensive digital activity related to the YSL exhibition they signed up for free 30 day trials to a number of analytical tools, along with monitoring the impact on the free Twitter analytics and Facebook Insights. 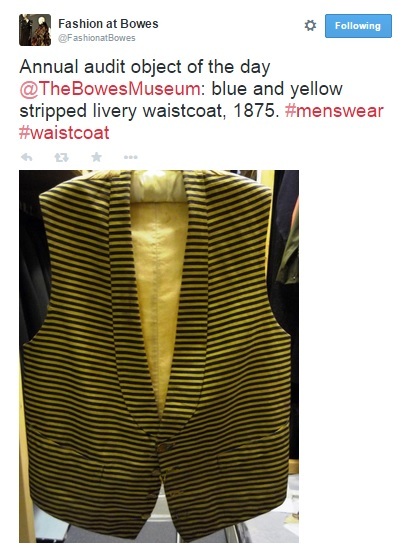 They found Moz to be a useful tool for measuring social authority, of both the fashion account and the main Bowes Museum twitter account. It provided a useful insight into the influence they have on social media, rather than purely focusing on growth of followers. The Bowes museum would like to grow the social authority and influence of Fashion at Bowes in the lead up to the YSL exhibition opening. From the analytics tools they were able to follow the metrics produced from the announcement. For example: The main Bowes Museum Twitter account has a strong existing following and this was used to increase the reach of the YSL announcement by engaging with followers. The impressions on Twitter are normally around 5,000 per day. Over the weekend of the YSL announcement, impressions peaked at 30,000.